Though most diamonds on the American market are graded by one of two organizations – The Gemological Institute of America (GIA) or The American Gem Society (AGS or AGSL) – there are many other organizations that offer diamond grading services. You may have seen diamonds featuring certifications from organizations like the EGL, IGI, or the GSI. In this series, we’ll dive into the most common of these grading reports to make sure you have the information you need to make an informed decision on your diamond purchase. First up in this series are EGL diamond grading reports. EGL stands for European Gemological Laboratories, which was established in 1974 and claims to be the largest independent network of gemological laboratories. Along with the European network, EGL certificates are also issued by several other countries: EGL India, EGL South Africa, EGL Platinum (Israel), and EGL USA. As you can imagine, having such a wide network without a central governing body to enforce unified practices and philosophy can be problematic. This is especially true for diamond grading, since it relies heavily on the perceptions of highly trained gemologists to provide accurate assessments that are consistent across all labs and countries. While the GIA has many laboratories across the world, it functions as a single business entity and has consistent standards and procedures across all of its labs. In practical terms, that means that the GIA always grades diamonds consistently. On the other hand, the EGL’s standards (or lack thereof) can lead to diamond quality grades varying quite a bit from lab to lab. Furthermore, EGL tends to overestimate diamond quality in both color and cut grading. Many diamond experts have noted that the EGL overestimates diamond color grades. For example, an EGL lab might give a diamond a color grade of D, while the GIA would call the same diamond an F color. Learn more about diamond color grades here. Unfortunately, the cut grades on an EGL diamond can also misrepresent the actual quality of a diamond. For example, an EGL Ideal Cut diamond might only be considered a Good Cut by the AGS or GIA. So you may think you’re getting a really good price on a high quality diamond, but oftentimes, you’re paying less — but for inferior quality. Learn more about diamond cut grading here. You should also know that EGL Europe offers preliminary reports to diamond dealers. If diamond dealers don’t like the grades their diamonds receive, they don’t have to pay for the certificate. This incentivizes the EGL to offer more favorable grades to generate certificate revenue. Because EGL certificates can be so unreliable, the golden standard of diamond trading, RapNet, actually banned diamonds with only EGL reports. The US branch of the EGL also tried to get non-US EGL certificates banned by the U.S. Bureau of Customs and Border Protection. 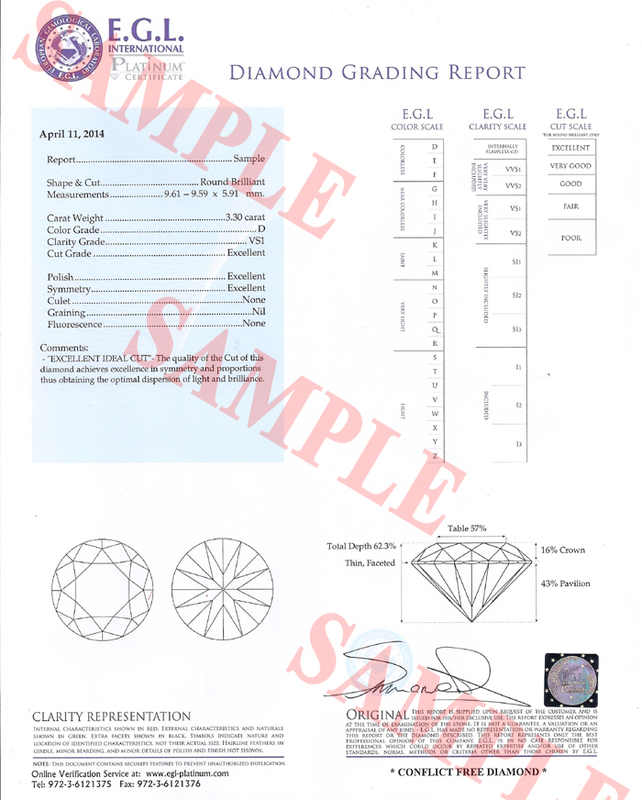 Due to the EGL’s inconsistent quality standards, pricing for EGL diamonds may seem lower than comparable diamonds with GIA or AGS certifications. This is because they are not actually comparable. As we mentioned above, cut and color are often overstated in EGL grading reports. So if you’re comparing diamonds side by side, it’s important to make sure they’ve both been graded by the same organization. Since the EGL operates from several different countries, you’ll find several different versions of the EGL Diamond certificates. Here are samples from the major EGL networks. Should I buy a diamond with an EGL certificate? While any diamond holds some intrinsic value, you want to make sure you’re not overpaying based on an inflated value assigned by a third-party with questionable motives. When shopping for diamonds, the same adage holds true: if it sounds too good to be true, it probably is. We’d recommend against buying a diamond with only an EGL certificate online, but use your own best judgement. Just keep in mind that the EGL can overstate a diamond’s quality by 2-3 grades. At this point you might be wondering whether it’s worth going with an EGL certified diamond simply to save some money. Does it really make a difference if a diamond is a D color grade or an F color grade? We recommend you see for yourself. Go to a respected jeweler and ask to compare diamonds of various quality grades. Most jewelers are happy to show you comparisons, so you can see the difference for yourself. And when you’re ready to buy a diamond online, remember that you can see any diamond in Ritani’s inventory before you buy it with our Free In Store Preview program. And at Ritani, we only sell diamonds graded by either the GIA or AGS because they adhere to the most stringent and exacting standards when it comes to grading diamonds. Looking for GIA and AGS certified diamonds?